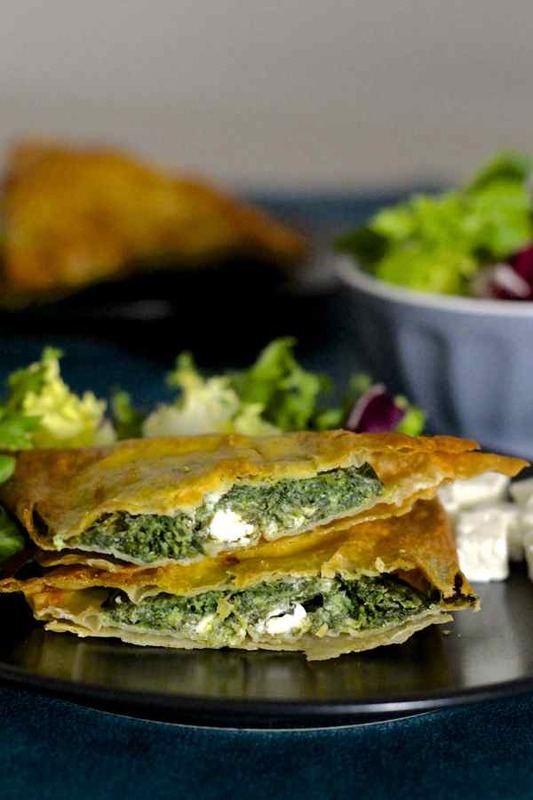 Today, we are headed to Greece for a very popular and delicious vegetarian pie called spanakopita. 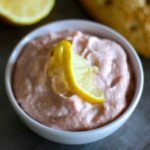 Greek cuisine is so varied and rich in influences that one could almost write an entire history book for each Greek recipe. Indeed, Greece is situated at the southern tip of the Balkan Peninsula, in southeastern Europe and is surrounded by the Ionian Sea and the Aegean Sea. It includes a continental region that consists of Attica, the Peloponnese, Central Greece, Thessaly, Epirus, Macedonia and Thrace, but also an island region made up of 437 islands, the main ones being Crete and Euboea. 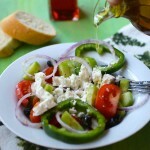 The richness of Greek cuisine is explained by its history. 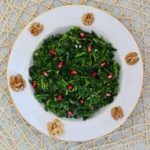 While some recipes date back to antiquity, one cannot overlook the influence of the Ottoman occupation, which obviously gave this cuisine strong ties to Turkish cuisine. Turkish cuisine benefits from its Ottoman legacy and borrows the flavors of Asia, the Middle-East and the Mediterranean region. It is one of the richest cuisines in the world and it has developed through the migration of the Turks over the centuries, from Central Asia to Europe. The main ingredient for spanakopita, besides phyllo dough, is spinach. In Greek, it is called σπανακόπιτα: the root σπανάκι is for spinach, and πίτα for pita or pie. Spanaki therefore means spinach and pita means pie, as I explained to you in my post abour prasópita, a delicious leek pie from Greece too. 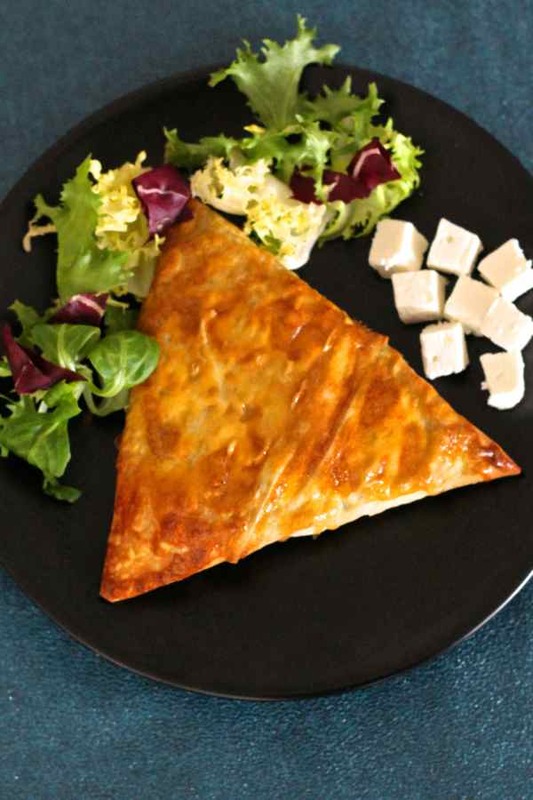 Spanakopita can be presented in different ways, the most common forms being the individual triangular shape, the rectangular pie cut into individual square portions, or the round pie cut in triangular slices. The stuffing is obviously composed of well-known Greek cheese feta, which has no more secret for 196 flavors. Also, although the addition of ricotta is not mandatory, I obviously went for it! Spanakopita is first and foremost supposed to be filled with spinach but curiously, in Greece, spinach is often replaced, partially or completely, by chard or sorrel leaves, or by the green part of the leek and it is still called spanakopita. Some variants suggest incorporating roasted pine nuts and kefalotyri, a Greek hard cheese that is very similar to Gruyere. What is the origin of spanakopita? It seems that spanakopita originated from Turkish cuisine more than 400 years ago. Indeed, spanakopita was probably introduced during the Turkish occupation of Greece. Also, a Turkish recipe called ispanaki börek, is almost identical in the preparation and presentation, although it contains shallots where Greeks use onions. Kotópita for chicken, tiropita for cheese, or prasópita for leek: you understand that the beginning of each dish refers to the main ingredient with which the pita is stuffed. Note that we are not talking here about the world famous pita bread but Greek pita which means “pie”. In Israel, these “pies” are known as borekas and in Bulgaria, they are called banitsa. I prepared this spanakopita recipe over the Christmas holiday as my son Ruben, who lives Hong Kong, was visiting Paris. I am very proud as it was the first time in his life that my son agreed to eat spinach, and he loved these little pies! They were delicious indeed. Whether hot or cold. Enjoy! 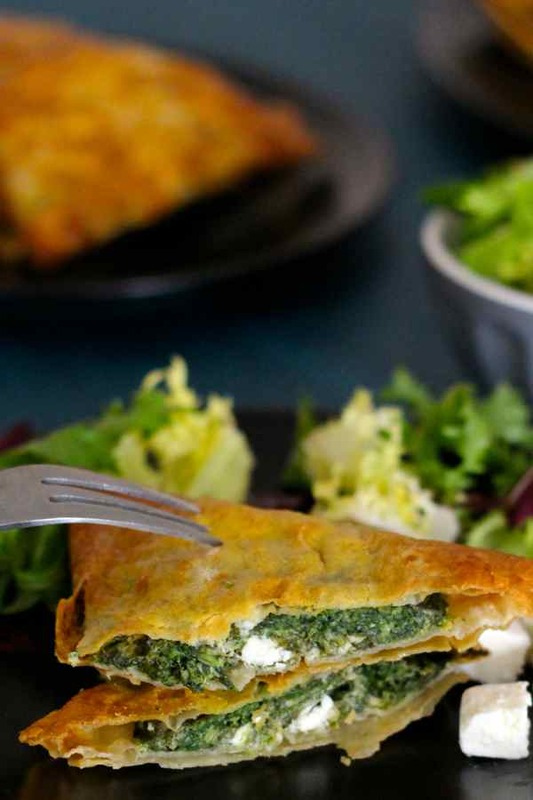 Spanakopita is a famous traditional Greek recipe which consists of a phyllo dough based pie stuffed with spinach and herbs. Heat 3 tablespoons of olive oil in a pan and sauté the onions and spinach over high heat for 5 minutes, stirring constantly. Set aside until cool. Put spinach and onions in a large bowl, add dill and parsley and mix well by mashing with your hand or with a potato masher. The volume is reduced by half. Add remaining ingredients, except olive oil, and mix well. Line baking sheet with parchment paper. Add one filo sheet. 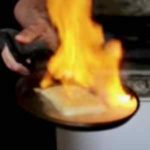 Brush with oil and place a second sheet and so on until the ninth. Spoon filling over the entire surface. Place a sheet of phyllo dough, oiled lightly and proceed in the same way for all the remaining sheets. Fold the edges and oil the surface of the last sheet. Press on the pie. Draw portions with a knife at the surface. Bake in an oven preheated at 350 F until lightly browned, about thirty minutes. To get a crispy dough that may have softened the next day, bake the leftover pie for a few minutes. I am greek and have been making spanakopita for years .Ricotta is unheard of in this pie and parsley .you already have dill and green onion .Eggs for helping the ingredients hold together ,I use bread crumbs to absorb liquid which spinach gives off.Olive oil and of course crumbled feta .If you use store bought filo dough ,use the thick country style as the other is to be used for pastry . Hi there. Have never tried a true Greek spanakopita, but make a fine pie using thin home made pastry, and fill it with spinach, washed drained and finely chopped, crumbled feta, and couple eggs, bit of yoghurt, freshly grated nutmeg and black pepper.. If there be no spinach in the garden, i have made same with a mix of nettles rocket mustard greens, and wonderful greek oregano, that am fortunate enough to have growing. Delish! !